Shaykh `Abdul Razzāq ibn Muhammad Hasan ibn Rashīd ibn Hasan al-Halabī was born inDamascusat his father’s home in the suburb of al-Qaymariyya in 1925 (1343H). The Shaykh grew up in a religious environment as his father regularly attended the lessons of the `Ulemā and his mother was the daughter of the Muftī of Syria, Shaykh Ata`illāh al-Kasm. Shaykh `Abdul Razzāq’s father passed away when he had not yet exceeded eight years of age. He was cared for by his mother and his uncle, Muhammad `Id al-Halabī. after which he abandoned formal studies and began working as a manager between the 2 years 1939-1952. In 1955 the Shaykh married from the Zabīb family of Damascus. He has been blessed with seven children. acquiring knowledge from the foremost `Ulemā. The Shaykh memorised the Qur’ān, the text of al-shātibiyya and al-durra and he completed the ten qira’āt. He also studied fiqh, various books of tafsīr, Hadīth and the Arabic language with various scholars. Shaykh `Abdul Razzāq also memorised the alfīyya ibn mālik and various other texts. Sālih’s guidance and supervision, Shaykh `Abdul Razzāq read and studied tafsīr al-nasafī, sharh muslim by Imām al-Nawawī, al-targhīb wal tarhīb, nūr al-idāh and al-marāqī and the hashīyya by al-Tahtāwī. He also studied al-qudūrī and its commentaries, majma` al-anhūr, aldur al-mukhtār, hāshiyyat ibn `abidīn, al-manār and its commentary, al-bayqūnīyya and its commentaries and tadrīb al-rāwī. After reading the alfīyya to Shaykh Sālih al-Farfūr, he was rewarded in that whatever he studied thereafter, Shaykh Sālih simplified it for him. •Shaykh Mahmūd Fā’iz al-Dā’ir Atānī With him, Shaykh `Abdul Razzāq memorised the Qur’ān and al-shātibīyya. • Shaykh Muhammad Sa`īd al-Halwānī With him he started learning the qira’āt. He failed to complete it because his teacher passed away. • Shaykh Husayn Khattāb Shaykh `Abdul Razzāq completed the study of the ten qira’āt under him as well as alshātibīyya and al-durra. He received Ijāzah from him. He also met and is well acquainted with Shaykh Abūl Khayr al-Maydānī, Shaykh Makkī al-Kattānī and Shaykh Ibrahīm al-Ghalayyinī. which hundreds studied under and benefited from him. as per the narration of Warsh as well as the arba`īn al-ajlunīyya and he also received Ijāzah. Shaykh `Abdul Razzāq dedicated his life to teaching and guiding the Ummah. The Shaykh taught at Mahad al-Fath al-Islāmī in its specialisation programme. Some of the texts he has taught include: sahīh al-bukhārī, al-shifā by Qādī Iyād, hāshiyyat ibn `abidīn, tafsīr al-qurtubī, al-ikhtiyār, hāshiyyat al-tahtāwi `alā marāqil falāh, tafsīr al-nasafī, tafsīr al-khazīn, ihyā `ulum al-dīn, riyād al-sālihīn, sunan abī dawūd, jami` al-usūl and many others. The Shaykh was appointed as a lecturer and a public speaker (khatīb) in numerous mosques – in Jāmi` al-Qittāt for fifteen years, Jāmi` al-Jarāh for twenty-four years and then finally at Masjid Bilāl. He took over the administration of the Grand Ummawī Mosque and was the leading Hanafī scholar there. Shaykh `Abdul Razzāq al-Halabī was one of the founding members of Jāmi`at al-Fath Al-Islāmī along with Shaykh Muhammad Sālih al-Farfūr and he took over as the head after Shaykh Sālih’s demise. He has traveled through countries likeEgypt,Libya,Iran,Malaysia,Turkey, the Gulf, Kuwait and Saudi Arabia, delivering lectures from which many benefited. Shaykh `Abdul Razzāq has combined vast knowledge with the excellent qualities and character of the pious. He is not a person who is attached to worldly glitter and gives abundant sadaqa. He firmly adheres to the Sunnah and is not a person who holds any hatred or malice against anyone. The Shaykh is very concerned about the affairs of the people and is loved by all in his country. Shaykh `Abdul Razzāq has performed Hajj over forty times. May Allah protect him and may He bless him in his life and in his knowledge. 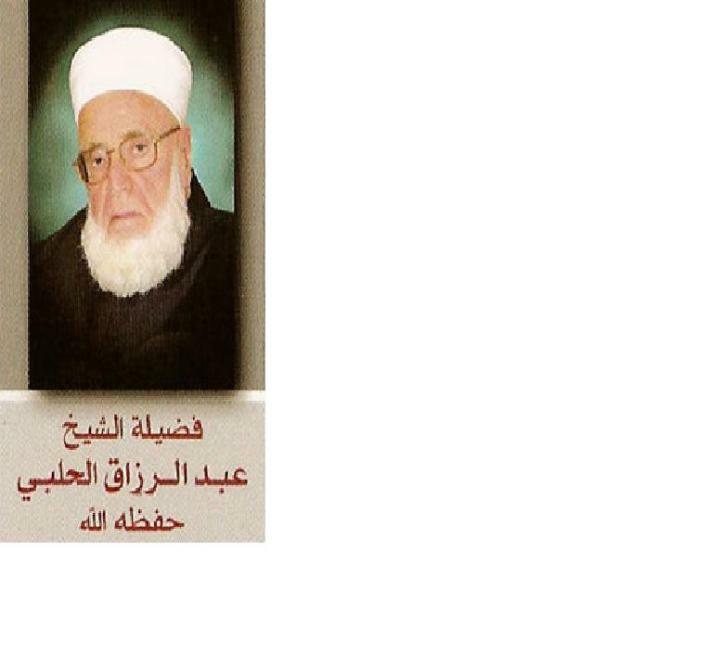 Shaykh Abd al-Razzaq al-Halabi is the leading living Hanafi scholar of Damascus. He has taught the Hashiya of Ibn Abidin (‘Radd al-Muhtar) at least a dozen times, cover to cover. This work is in 5 very large volumes in its old (Bulaq) edition, and the new editions range from 12 to 20-plus volumes. This dars would occur between Maghrib and Isha daily, without fail, six days a week–with Fridays off. He is very serious about completing books with his students, and inculcates a seriousness for study and the subject in his students, as well as having stern disapproval for wasting time, useless questions, and foolish behavior. May Allah preserve Shaykh Abd al-Razzaq and the scholars of our Community, and spread the light of their teachings and example–for this light is the Prophetic inheritance. It is the gift of God to humanity.